I like this quote. 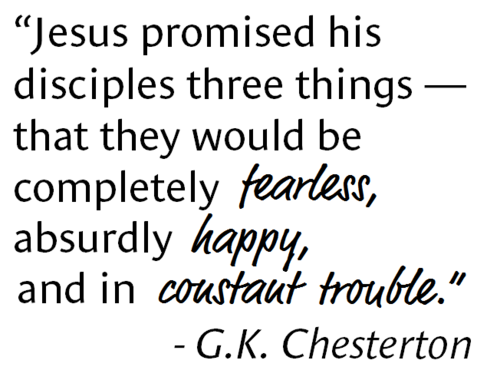 The early Church was all of these things: Fearless, happy, and very much in trouble. Luke wrote of the nascent exploits of this group of people in the Book of Acts, and while some believers will debate different aspects of theology, none can diminish the reality. These were human beings irrevocably touched by the Holy Spirit. Some have even suggested that the title of the book be changed to “the Acts of the Holy Spirit.” (Instead of “Acts of the Apostles”). When the fire of the Holy Spirit meets the dry tinder of the heart, it explodes into a conflagration that can’t be contained. It boils over and touches everyone around it. The disciples became fearless. Their boldness could not be diminished or diluted. They were so courageous (and contagious) that they preached to both kings and beggars. They were “happy.” Once they had surrendered their personal ‘agendas’ they became immune to the negative issues of life. They soared with the eagles of contentment and joy. They no longer lived in the ‘mud’ of human life. They were ‘Teflon’ to that which can be so sticky. Happiness is the deep evidence of a personal contact with God’s own spirit. But they ‘were in constant trouble.’ There may never been a people so maligned and persecuted. The apostle Paul faced daily obstacles. As the de facto leader of the church, he absorbed a lot of hatred and wrath that was focused on the early Church. Everywhere he went this darkness would descend, and each time God met him. Honest reflection is in order I think. We should really determine if we have the very same spirit that the early Church possessed. Whether or not, we should amend our relationship with the Spirit of God, and seek to be more tractable to His work. We start by believing the truth about our hearts and lives. The Truth is stronger than the lies. This post was not intended to condemn. If you have read that into these words, I ask forgiveness. But reading this over, I will retract nothing. But I still ask that you ‘spiritually check’ each thought. Is it biblical, and does it glorify the Lord Jesus? I want to be fearless and happy and in trouble for the right reasons. God bless you! Great post!